Winter squash, members of the Cucurbitaceae family and relatives of both the melon and the cucumber, come in many different varieties. While each type varies in shape, color, size and flavor, they all have hard protective skins that are difficult to pierce that gives them a long storage life of up to six months and a hollow inner seed containing cavity. 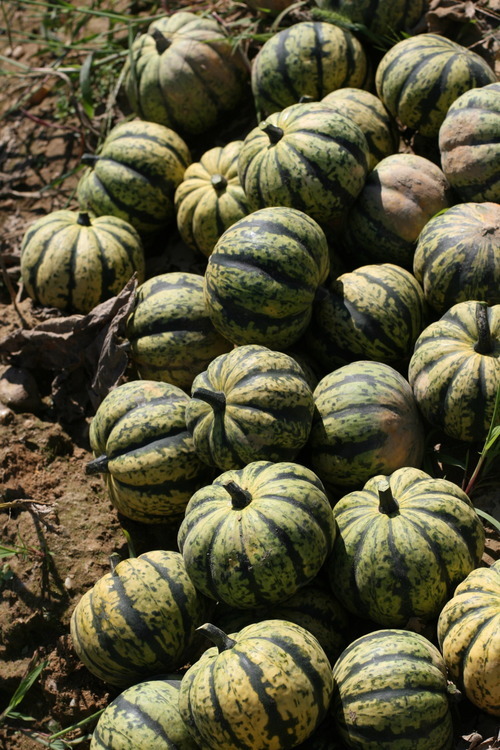 We grow Butternut, Sunshine, Acorn, Buttercup & Sweet Dumpling Varieties. Winter squash should be stored at room temperature - and dry. Keep in paper bags or baskets out of direct sunlight and they will last months. Working with squash is one time you will want a big, heavy chef's knife or cleaver. First, cut off the stem and then insert the point into the squash and press down hard to plunge it in. Pull the knife toward you and then away in a rocking motion. You can also bake your squash whole, then halve it and remove the seeds, and scoop out the flesh once it's softened up a bit.